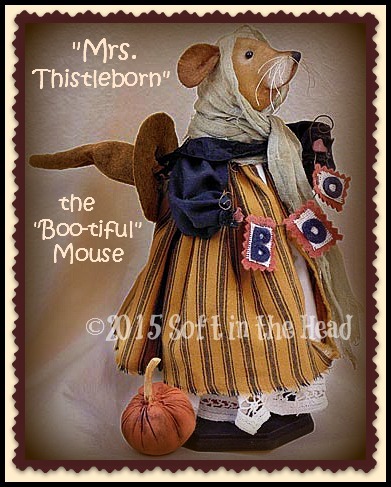 Mrs. Thistleborn is a fabric mouse made from muslin and felt. She has a stitched and painted face and glass beads for eyes. She is coffee dyed and is dressed in layers of clothing. Her arms are pos-able and she stands 9.5" tall. She is an easy pattern to follow for the beginner crafter. This mouse would be great for your shows and online marketplaces. The directions include how to make the fabric pumpkin and the Boo banner. This is an original "Soft in the Head" design by P.K. Gracia ©2015.....Pattern can not be re-sold online but finished pieces can be sold at shows and online venues but plese give credit to the pattern designer. 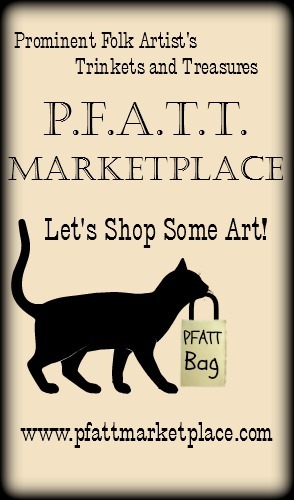 No mass producing pattern or finished pieces please.